The developer behind Shadowgate has a library of more than a hundred JRPGs ready for localization. There was a time when the JRPG was king. Recent years however have seen the genre fall to wayside of popularity and take up more of a niche role in the North American market, for a variety of reasons. This has left many fans in the sad predicament of often not having as many games to play as they'd like. One developer, however, hopes to make the future a brighter place for JRPG-devotees and has a library of more than a hundred games at its disposal to do it. Kemco, the studio behind the NES port of Shadowgate largely abandoned console development in the mid-2000s, turning its attention instead to phone games that were becoming popular in Japan at the time. "Feature phones cannot support 3D graphics, so we had to make 2D style games," said Masaomi Kurokawa, the manager of Kemco's Mobile Business Department. These hardware restrictions, coupled with Japanese gamers hungry for role-playing content, led to the company investing in a slew of JRPGs. "We have more than 100 JRPGs. We have made a lot of these games with different concepts." As iPhone and Android devices began growing more popular in Japan, Kemco took to porting its library to those systems and now wants to localize its games for English speaking audiences. 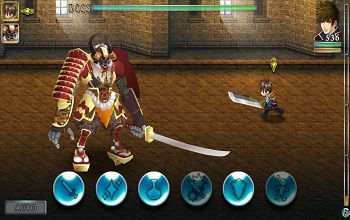 "We know that there is a huge audience outside of Japan," said Kemco's Matteo Conti. "Each month we plan to release two titles, one for Android and iOS." In the long run this should amount to about twelve new JRPGs for both platforms over the course of a year. It's a strategy that should likely make JRPG fans happy and that has already led to a number of American releases.